September 25 – Did he compose the Salve Regina prayer? Chronicler, mathematician, and poet; born 18 February, 1013, at Altshausen (Swabia); died on the island of Reichenau, Lake Constance, 21 September, 1054. He was the son of Count Wolverad II von Altshausen. Being a cripple from birth (hence the surname Contractus) he was powerless to move without assistance, and it was only by the greatest effort that he was able to read and write; but he was so highly gifted intellectually, that when he was but seven years of age his parents confided him to the learned Abbot Berno, on the island of Reichenau. Here he took the monastic vows in 1043, and probably spent his entire life. His iron will overcame all obstacles, and it was not long before his brilliant attainments made him a shining light in the most diversified branches of learning, including, besides theology, mathematics, astronomy, music, the Latin, Greek, and Arabic tongues. 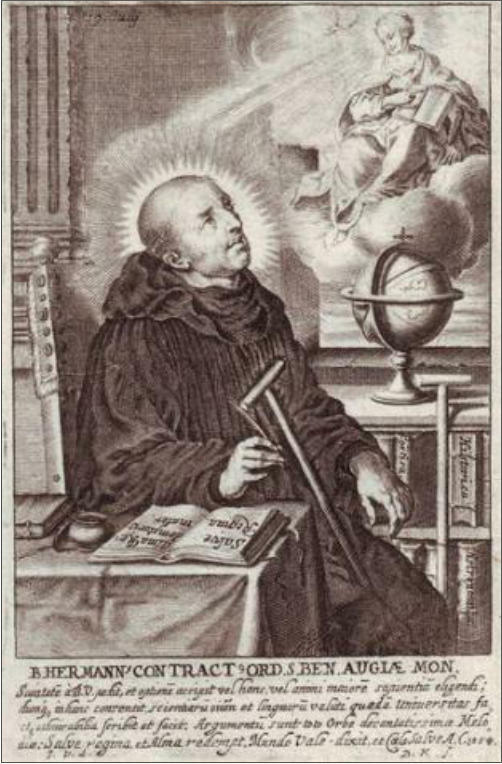 Students soon flocked to him from all parts, attracted not only by the fame of his scholarship, but also by his monastic virtue and his lovable personality. We are indebted to him chiefly for a chronicle of the most important events from the birth of Christ to his day. It is the earliest of the medieval universal chronicles now extant, and was compiled from numerous sources, being a monument to his great industry as well as to his extraordinary erudition and strict regard for accuracy. While it is not improbable that this work was based on a previous state chronicle of Swabia, since lost (called “Chronicum Universale Suevicum”, or “Epitome Sangallensis”), it has nevertheless a significance entirely its own. But the full measure of his genius appears from the objectivity and clearness with which he wrote the history of his own time, the materials of which were accessible to him only by means of verbal tradition. An artistic rendering of “Herman the Lame” as he is sometimes called. He also wrote mathematico-astronomical works. Of his poems the most successful was the “De octo vitiis principalibus”, which he addressed to nuns, and in which he gave proof of uncommon skill in the handling of different kinds of metres, as well as in the charm with which he contrived to blend earnestness with a happy mirth. He composed religious hymns, and is not infrequently credited with the authorship of the “Alma Redemptoris Mater“, and the “Salve Regina“. 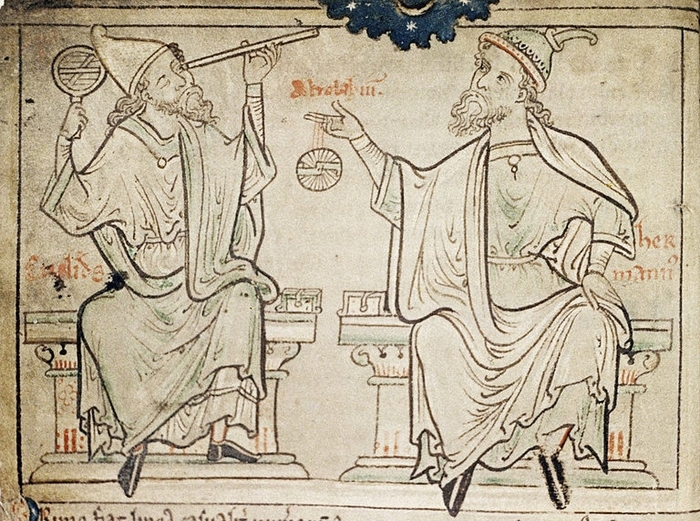 Finally, it may be mentioned that Hermann constructed astronomical and musical instruments. He was beatified in 1863.